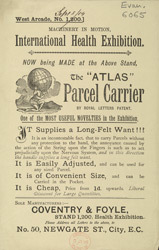 The "Atlas" Parcel Carrier was essentially an adjustable strap that could be used as a harness around heavy items, making their transport easier and less tiring to the hands. The product has been given a weighty classical name: in Greek mythology, Atlas was the Titan who supported the weight of the heavens on a pillar. As the Greeks conceived of the universe as concentric (with the Earth at the centre), Atlas is traditionally depicted holding a sphere.